Getting a lot of questions about these bugs. Figure 1. Immature green stink bugs on soybean. of the nymph stage (immature) green stink bugs. It is quite common to see aggregates of these near the end of the season. They are generally noticed because they are near the tops of plants, and leaves are beginning to drop. of the Maryland Grain Producers Utilization Board. On July 1, 2014 Dr. Josh McGrath started with the Department of Plant and Soil Sciences, College of Agriculture, Food, and the Environment, University of Kentucky as an Associate Professor and Extension Specialist in soil management. Prior to joining the faculty at University of Kentucky, Dr. McGrath was an Associate Professor and Extension Specialist at University of Maryland and was heavily involved in Chesapeake Bay water quality issues. Dr. McGrath’s research and Extension program in Maryland focused on agricultural productivity and environmental quality as they relate to soil fertility, nutrient management, and water quality. 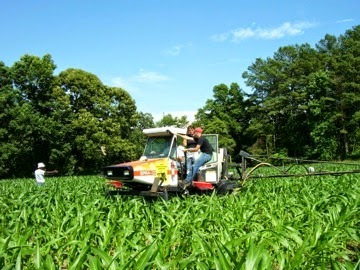 He has conducted research and Extension programming on enhanced efficiency fertilizers, phosphorus management to protect water quality, sulfur fertility, in-situ treatment of agricultural drainage to remove phosphorus and nitrogen; precision agriculture and variable rate nutrient management; and manure management in no-till. Wheat diseases reduce grain yield and/or quality in most years. 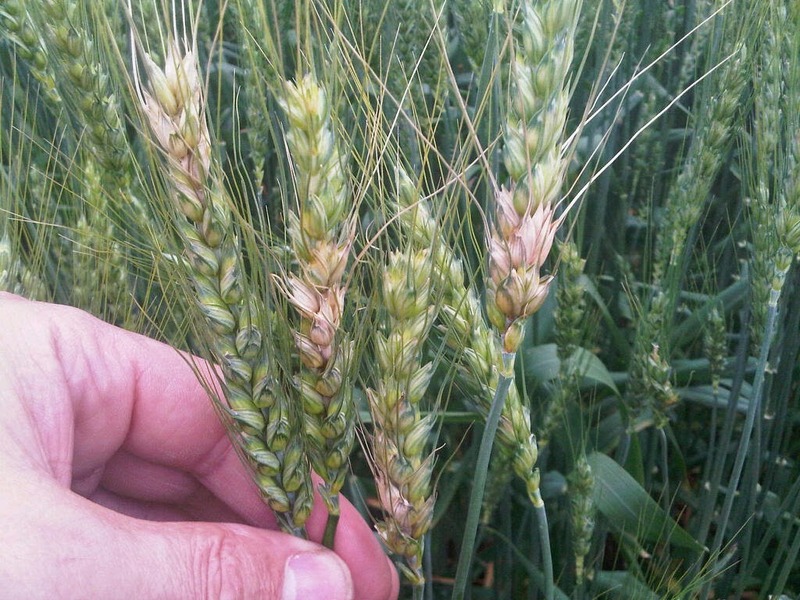 Many wheat producers rely on foliar fungicides as their primary disease management weapon. Foliar fungicides are certainly an important disease management tool. However, pre-plant decisions made – that is, decisions being made right now for the 2015 wheat crop - have the greatest impact on which diseases develop during the season and to what extent. Thus, it is critical to make as many of the “right” decisions as possible to reduce the potential for diseases to reduce both grain yield and quality next spring. Symptoms of sudden death syndrome. There have been numerous reports across the state of soybean sudden death syndrome (SDS) showing up in certain fields since August. SDS, which can be a devastating disease, is caused by the soil fungus Fusarium virguliforme (Fv). Fv is actually a soilborne fungus that attacks roots early in the season and later causes a root rot. Infection is favored by cool soils with good moisture; thus, this spring was perfect for infection in most full-season fields. 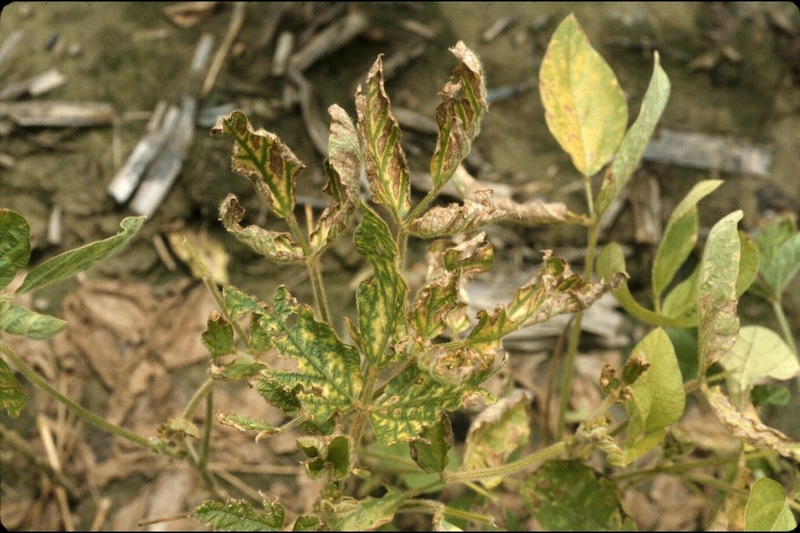 As plants go into the reproductive stages, the causal fungus produces a plant toxin that causes above ground foliar symptoms of yellowing and tissue death between the veins (see below picture), and later defoliation. 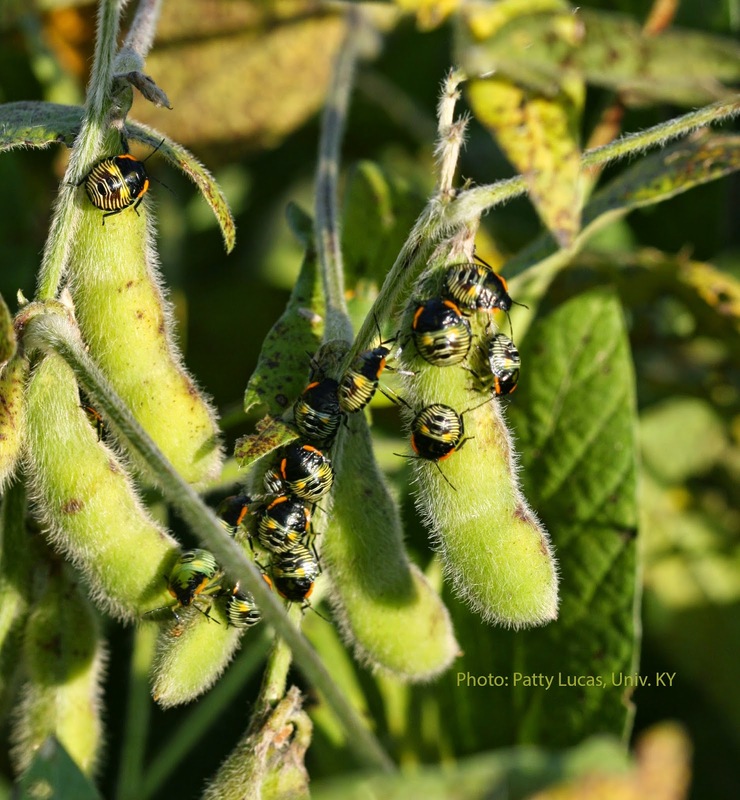 If the disease comes into the field during the early pod development stages, and enough of the field is impacted, SDS can result in almost total yield loss. 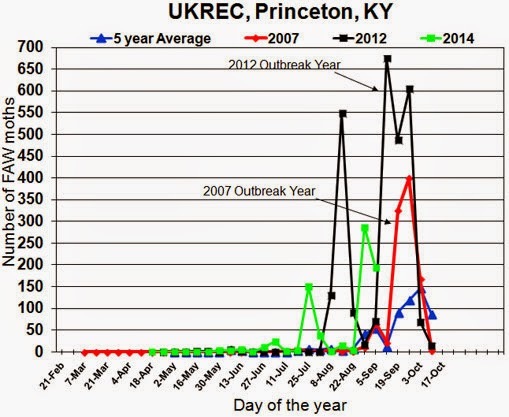 This is, however, an extremely rare event in KY. More typically, the disease causes significant yield losses in spots in a field - usually the lowest portions where soil moisture is greatest - but the majority of the field has little to know yield impact. That is, most plants either escape disease altogether or symptoms come in after mid to late -pod fill. Plants showing late symptoms will generally yield very well. Thus, the appearance of symptoms is not necessarily a good indicator of yield loss potential. Timing of symptoms is everything when it comes to SDS. The 2014 Kentucky Extension Corn and Soybean Contest forms are available online. Both forms are linked at the Grain Crops Extension Yield Contest page. Got Fall Armyworm? Want Some More!!! For the past week or so we have been dealing with large populations of fall armyworm (FAW) caterpillars. These hungry little pests have devoured alfalfa, forage and lawn grasses while munching around the edges of soybean fields. I am sorry to inform you that while this problem is decreasing it may also reoccur. The 2014 Wheat Contest Winners are available online. The highest yield submitted was 120.26 bushels per acre by Jeff Coke in Daviess County. Jeff's field was disced twice. The highest no-tillage yield reported in 2014 was 115.98 bushels per acre by Duncan Gillum in Todd County. Both Jeff and Duncan are repeat winners from 2013. Area winners for 2014 included Merle Coblentz, SBJ Fischer, Gary Summers and Homestead Family Farms. Something is Definitely Up with Fall Armyworm! !